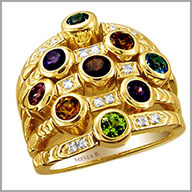 14K White or Yellow Gold Multi-Gemstone & Diamond Five-Row Ring.0.0700 ct of diamonds. This vibrant ring is crafted in your choice of polished 14K white or yellow gold. It features various round cut 3.5mm gemstones, including: two each citrines, blue zircons and amethysts. It also features one each round cut 3.5mm pink tourmaline, peridot and garnet, all are in bezel settings. They alternate with multiple stations consisting of 14 round cut diamonds in prong settings,The total citrine weight is 0.36ct, zircon weight is 0.50ct, tourmaline weight is 0.20ct, peridot weight is 0.20ct, amethyst weight is 0.40ct, garnet weight is 0.31ct and the total diamond weight is 0.07ct (all approximate). The diamond color is G-H with a clarity of SI. The setting size is 11/16" x 3/4" with a height of 1/16".